When you think of a financial audit, what is the first thing that comes to mind? For a lot of companies, undergoing a financial audit is both a good thing and a bad thing. It is a good thing as the company will gain investor trust and client trust when they are cleared after the audit is conducted and the audit report is submitted. On the other hand, it is also a bad thing because a lot of financial things need to be organized and kept track. 2. Determine the scope and purpose of your report. 3. Write a draft of your audit report. 4. Review your work and make revisions. 5. Submit to the right entity. A single mistake in the company’s accounting can blow up everything. Much importance is given to a financial audit report and is known as a good source of accurate and unbiased financial information. To learn and understand more about financial audit reports and how they are made, financial audit report samples and templates are provided for your reference including simple steps to help you create one. Certified public accountants or CPAs conduct financial audits and create financial audit reports for various institutions, especially those publicly listed companies. Even if you are not a certified public accountant, it still pays to learn how to create one. This way you will know what is being tracked and recorded in the financial audit report. Here are some steps that will show you how it’s done. Research about financial audit reports and educate yourself about what there is to know to create one. You can look up samples like daily audit report and other samples and templates as your reference or study material. You should know the scope and limitations of your report and list down your purpose for creating the report so that you can only include relevant and useful information. Start writing a draft of your audit report, including the letter to the company owner or the company’s board of directors, the introduction, the executive summary, and the auditor’s opinion. Check for any errors you may have on your work. Revise the contents of your report as needed while making sure that they stay relevant and coherent. The report should be submitted to the person whom you are addressing the letter to. Do this on or before the deadline of your report. If you are looking for a financial audit report sample that is complete and detailed, then the sample above is what you are looking for. The sample has a simple title cover, header and footer on every page, table of contents, etc. 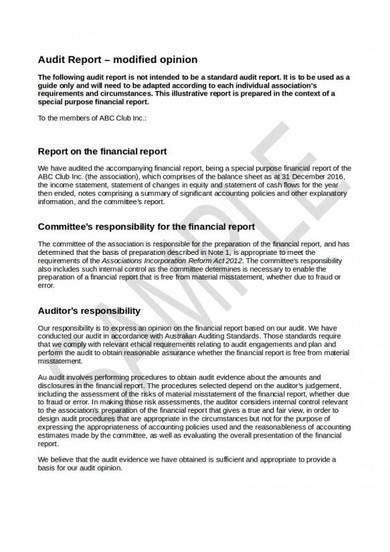 Each section of the report is numbered and written bold capital letters. Subsections are also provided and other contents are arranged in tabular form. An internal financial audit is done to evaluate and improve the operations of a company or organization. The audit is conducted by an auditor who is employed by the company. 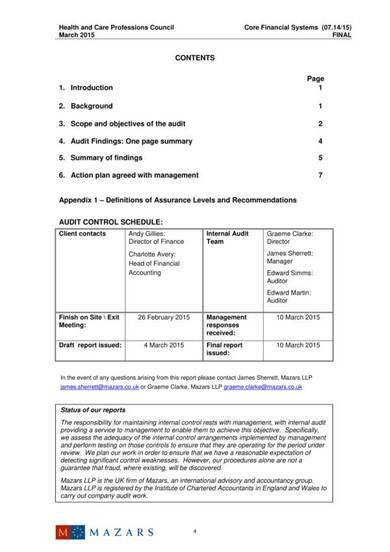 The sample above shows what an internal financial audit report looks like. If you need help creating one, you can use this sample as your guide or reference. An unmodified audit opinion is given by an auditor if the financial statements are presented fairly according to generally accepted accounting principles. The sample is a financial audit report with an unmodified opinion. It is a two-page sample that is available in Word which allows you to edit or modify it. Each section provides instructions on what information or details should be written under it. 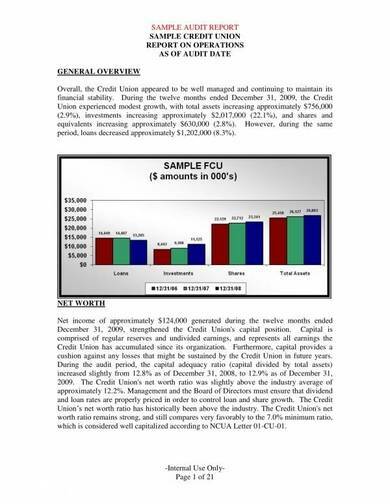 Credit unions get audited too, and this is how a credit union financial audit report loos like. A general overview is provided at the start of the report, and different graphs and charts are utilized to present data clearly and creatively. 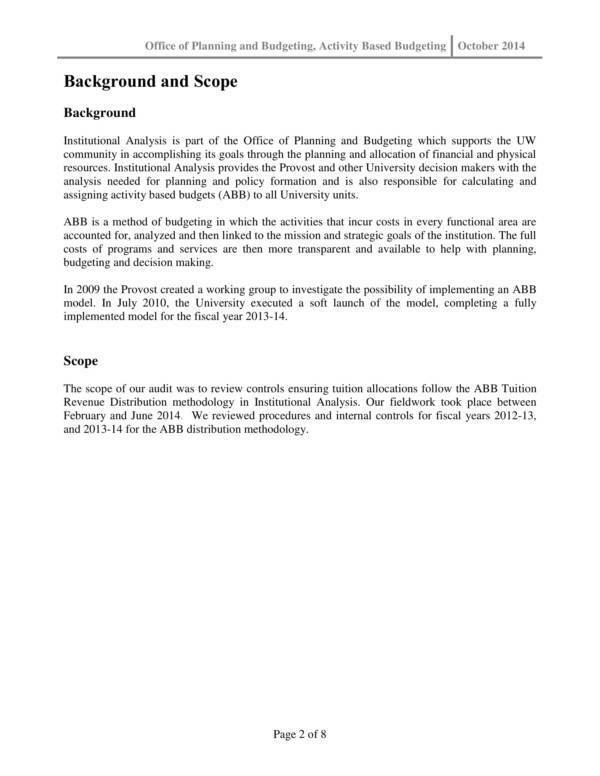 The general purpose financial audit report is a sample template that is available in Word. This allows the user to make changes or edit its contents based on the type of audit they are doing. Thorough instructions are provided in the sample. This type of report can be used for writing private company audit reports and HR audit reports. Independent auditors are certified public accountants (CPA) or chartered accountants (CA) who conduct audit on companies or organizations they are not affiliated with. Independent auditors can use the format that they prefer when creating their reports. 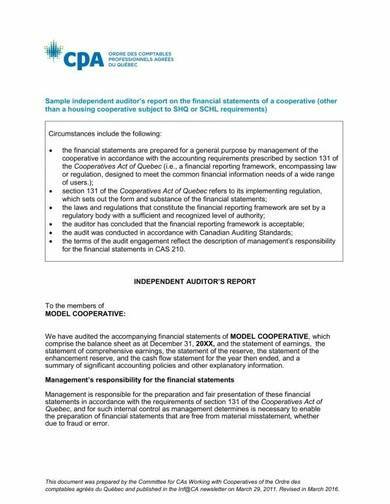 The sample above is a two-page financial audit report for a cooperative which includes a letter to the cooperative, the management’s responsibility regarding financial statements, the auditor’s responsibility, the auditor’s opinion, etc. A modified opinion is given in an audit report when the auditor finds errors, discrepancies, or fraud in your accounting books. If you need to make such type of audit report, then the sample financial audit report with modified opinion is just the right sample that you will help you to get the job done. 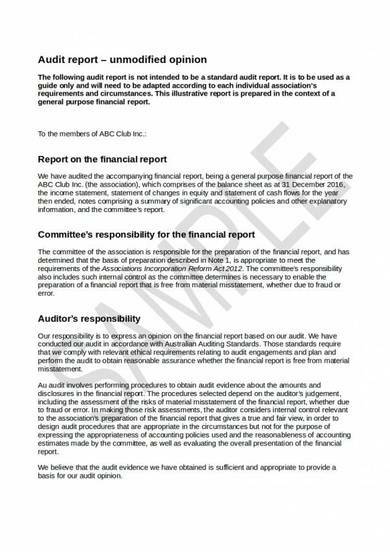 The external financial audit report sample is a financial audit report for the International Civil Aviation Organization. 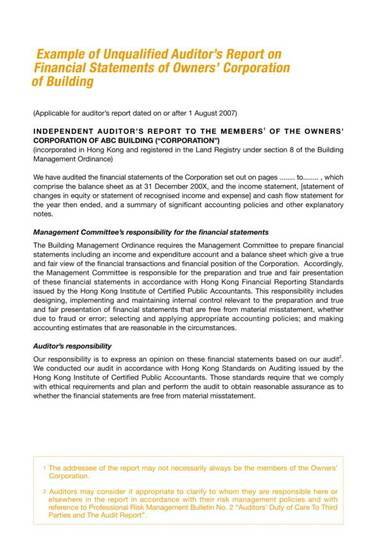 It is a six-part audit report which includes details about the report of the secretary general, the external auditor’s opinion, financial statements for the given year, etc. 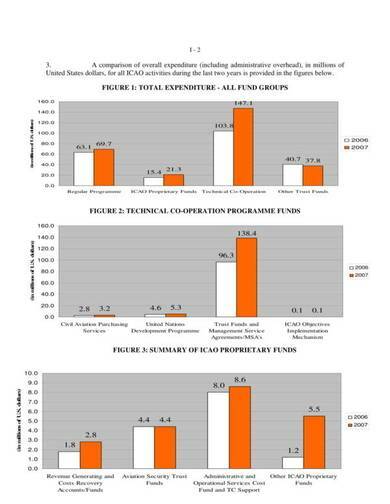 Bar graphs are also used throughout the report to represent data. This sample financial audit report is not only editable but it is also simple and easy to follow. 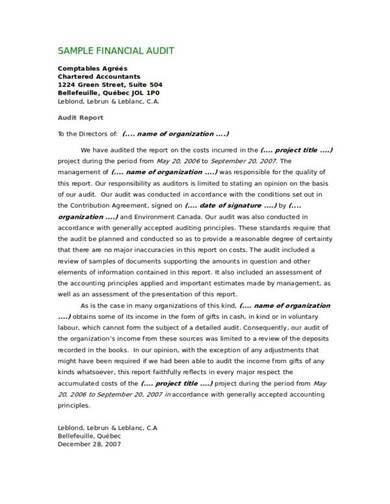 This is another sample that is available in Word and it includes a letter addressed to the directors of the organization, the project title, report on costs, income and expenditures, etc. An unqualified financial audit report is the most common type of audit report where the auditor states that the company or organization is compliant to the generally accepted accounting principles or GAAP. Laboratory audit reports and management audit reports can have unqualified audit opinions. When you need to create an audit report for the entire year, then you can use the annual financial audit report sample as your reference. 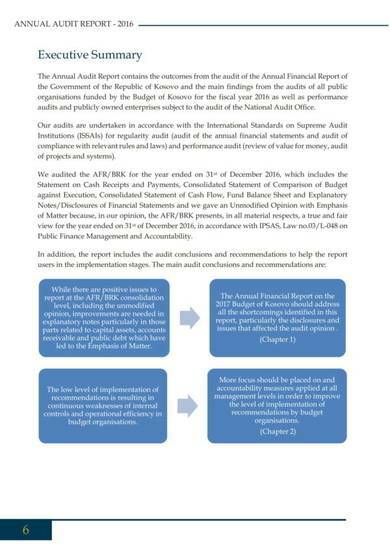 The audit report includes a list of abbreviations used in the entire report, foreword by the auditor general, an executive summary, an introduction, etc.